You know….I am really more and more convinced that antis have something to do with some of these incidents…. Geese were likely shot in mid to late December, that were found on the banks of Brazil Creek just west of Paulo Reservoir, about 10 miles from Glasgow. Twenty-two geese were found, including one that was completely processed. The other 21 had only the breasts removed. Under Montana regulations, all waterfowl larger than a teal duck need to have at least the breasts and thighs removed. 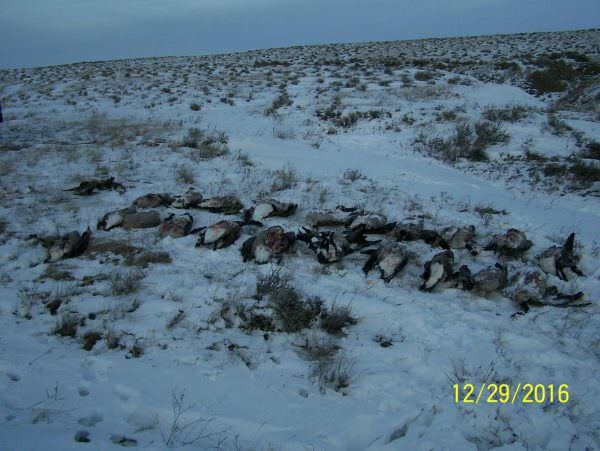 Anyone with information about the crime is encouraged to call FWP’s 24-hour wildlife tip line at 1-800-TIP-MONT (1-800-847-6668), or call Warden Sanderson directly at 406-263-0068.